Click on an item below to learn more about how chiropractic can help these common ailments! We’d love to discuss your specific allergy issue and how chiropractic may help! ​Asthma cases seem to be rising at an alarming rate. Some think it’s due to a combination of factors, especially the increase of chemicals in our environment. ﻿In fact, research published in the Journal of Vertebral Subluxation Research documented the results experienced by 81 children with asthma who received chiropractic care. The two-month study revealed that those under care saw a 45% decrease in the number of “attacks” and that 31% of the subjects voluntarily chose to decrease their medication. ​Have more questions? Contact our office today! ​Even before birth, restoring nervous system control of reproductive organs has blessed many chiropractic patients with the child they thought was impossible. ​Have your newborn checked shortly after birth to detect the effects of in-utero constraint, C-section, vacuum extraction or other aspects of a stressful birth. ​Biomechanical restrictions in the upper spine can compromise the nervous system and immune system, making your child’s ears a breeding ground for viral infection. ​Birth trauma, even from so-called “natural” birthing experiences can often produce a child’s first nerve compromise. Lacking the ability to communicate, your baby cries. And cries. By reducing neurological compromise to the bronchial tubes, lungs and diaphragm with chiropractic care, attacks can often be reduced or eliminated. ﻿Many of the hard-to-correct problems we see in adults are long-standing problems that began, and remained undetected in childhood. Have more questions? Contact our office today! 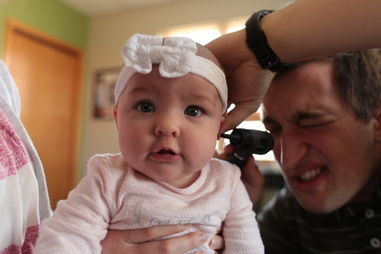 The number of children who suffer needless ear infections is jaw-dropping. Equally amazing is that pediatricians continue to treat them with antibiotics over and over again despite enormous amounts of research showing this approach is of no benefit, and can even be dangerous. Once the antibiotics fail again and again, these kids are then referred out for surgery to drill holes in their ears and insert tubes. In my professional opinion, this is as barbaric and antiquated as they come. Chiropractic helps tremendously by correcting the upper neck misalignment that is usually the cause. This helps the Eustachian tubes to properly drain, keeping infections from taking hold, and also boosts the function of the immune system. We also help the family make some simple nutritional changes that help enormously. ​Some are surprised to learn that their headaches are being caused by problems in their lower back! The upper spine compensates, shifting the head off center, causing headaches. While we can’t guarantee results, we have a high success rate with practice members who get headaches. Another essential part of our pregnancy/pediatric care is providing parents with all the information they need concerning health and wellness. From child nutrition, exercise, diabetes prevention, stress reduction or anything else, Dr. Tony is committed to providing you with complete wellness education that gives you the answers you need! ​Your nervous system controls and regulates every cell, tissue, organ and system of your body. The spine, especially in the lower back, can impair nerves that direct and monitor the reproductive and hormonal systems. Such as heavy bleeding or severe cramping. Including missed periods or infertility. Cells that normally line the uterus, implant elsewhere causing bleeding, pain and reduced fertility. ​Fortunately, improving joint motion in the lower back with a program of chiropractic adjustments has produced results for many people. ​​We understand the pressures of a busy life, and thus can really empathize with patients who are dealing with excessive stress and anxiety. We focus on helping these patients in two ways. First, we improve their ability to adapt to stress by improving the function and balance of their central nervous system, which governs and manages stress for us. Second, we use wellness education and empowerment to teach these patients how they can lower and lessens the stressors in their life through improved lifestyles. ​Have more questions? Schedule a free consultation today!